The African catfish is farmed in concrete basins in Africa. Farming started in early 1970´s as field trials did show that African Catfish is a fastgrowing fish which is very robust. African catfish tolerates a large variety of feedstuffs and is very resistant to changing and suboptimal water conditions. It is found to be able to being farmed in high densities reaching production levels of 6-16 MT/ha on an annual basis when raised in monocultures and fed high quality fish feed. Most of the African Catfish is sold alive into the market. The African catfish are harvested at an age of 6 to 8 month having a weight of 200-300g. 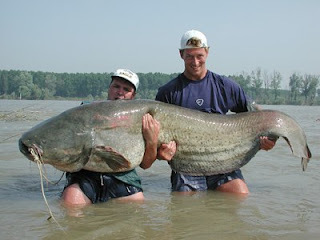 The meat of African catfish is mildly flavoured and has a tender texture If heavy and continuous overfeeding occurs phytoplankton growth will bloom which occasionally leads to a muddy flavour of the meat. Spawning in catfish is initiated artificially by hormone injection or injection of grinded pituitary glands of catfish or Tilapia into the ripe female. Spawning takes place in the night following injection were the female is placed with a male in a special net. The following day both the female and the male are removed. The eggs do hatch and after 3- 4 days the larvae are developed and transferred to the nursing pond were they are grown for 3-4 weeks until they have developed to fingerlings and transferred to the growing pond .